Serial #1! A limited edition of only 5000 of this coin will be minted. This 39mm commemorative coin is minted and carefully plated with fine silver. The players color image is embedded in the center via a unique process allowing the coin to be selectively colored. 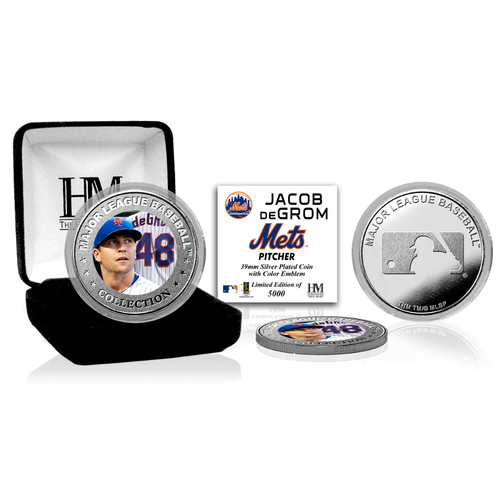 The back of the coin is struck with the MLB logo. Each silver plated coin is protected in a clear capsule to preserve its condition and delivered in a black velour jewelry case. As a limited edition of only 5000, each mint coin is individually struck with a serial number on its edge and accompanied by a certificate of authenticity. Officially licensed by MLB and MLBPA and proudly made in the USA by The Highland Mint.